“Architorture” is going to be famous! That may have been an overstatement. But, it is true that “Architorture” is moving up from it’s current position as a humble blog. How is this happening? Allow me to explain. 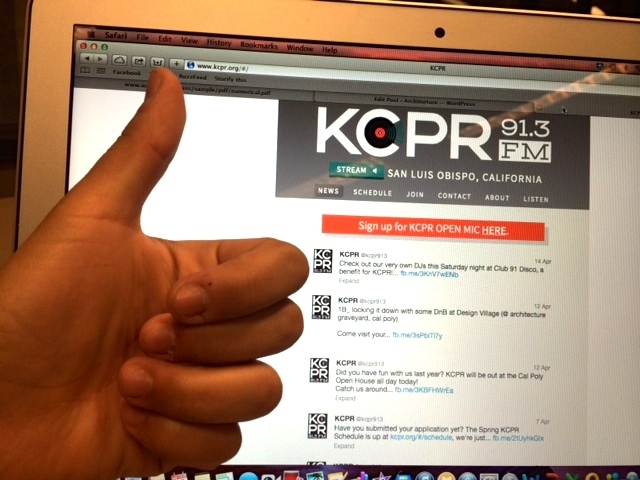 Cal Poly: San Luis Obispo has a radio station called KCPR and can be heard by the locals and university students on channel 93.1 FM. I was recently contacted by one of the station’s DJs asking if she could mention my blog in her news recap of the Design Village project. I said yes without hesitation. The KCPR news segment will broadcast at 5 p.m. Wednesday April 16. Tune in to hear about what they have to say about Design Village and to hear my blog mentioned. Click here to go directly to their live online stream. Even though the newscast will only quickly mention my blog once, it’s still exciting to have something that started out so small have the chance to be broadcast to a wider audience. That is all for me. We will continue our normal segments this weekend. I have a cool Storyboard story coming out this weekend so watch out for that. Tune in to KCPR on channel 93.1 FM or click on the link in the post to listen to them talk about Design Village. This entry was tagged architectural engineering, architecture, architorture, broadcast journalism. radio, Cal Poly, Celina, Celina Oseguera, journalism, Lauren, Lauren MacLeod, MacLeod, Oseguera, San Luis Obispo, Virtual Boyfriend. Bookmark the permalink.